You’ll see a lot of posts here at Good For You Gluten Free that involve pizza. It’s true, I love pizza and am always looking for restaurants that make yummy gluten-free pizza in Denver that is safe for a Celiac like me. Beau Jo’s is the place here in Colorado if you want to eat yummy gluten-free pizza and want to still feel great afterwards. Many Coloradans know Beau Jo’s – it’s the place to go for Colorado-style pizza (whatever that means, right?). They have locations in Denver, Arvada, Boulder, Ft. Collins, and Idaho Springs, along with a few other locations outside of the metro area including one in Steamboat Springs that I’ve visited once too. 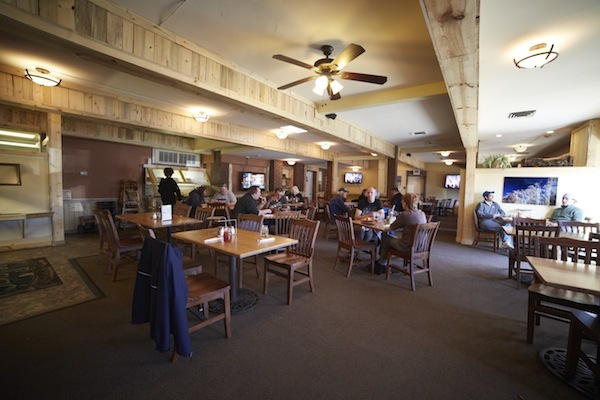 My family and I are regulars at the Beau Jo’s in Denver (Yale & Colorado Blvd), and we often visit the one in Idaho Springs on our way to the mountains. I took this picture on my last trip to Beau Jo’s just this past weekend. I couldn’t wait – I had to eat a bite before I remembered that I hadn’t taken a photo yet. Oops! The crust is thin and crispy, but not hard, grainy or burndt. The cheese is gooey (I order the low-fat cheese), and I added mushrooms and tomatoes as my toppings of choice. I usually eat half the pizza and take the rest home to enjoy the next day – it’s a generous portion! 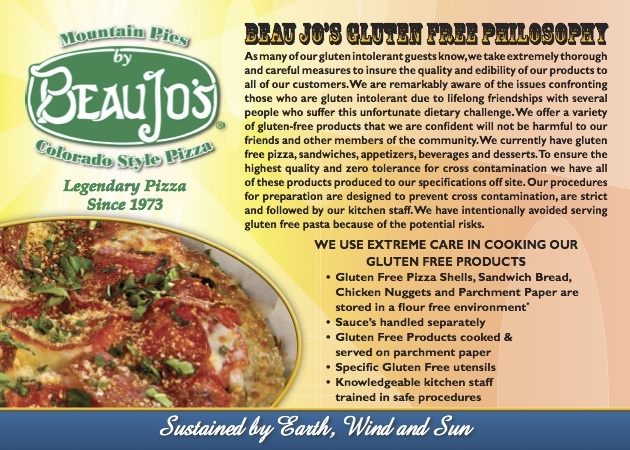 Beau Jo’s is committed to making its food gluten free and catering to the Celiac community. It is a Celiac Spruce Association member, and each restaurant carries Udi’s gluten free desserts too. While eating out is always a risk for someone with Celiac, I have never felt sick after eating at Beau Jo’s. They take great care to avoid cross contamination and their staff is well trained. Read their gluten free disclosure statement – it definitely puts your mind at ease! They use words like “extreme care in cooking our gluten free products.” No one says that unless they are extremely careful. Feels good knowing that, right? When I order there, I don’t have to go through all the mojo of explaining how I want my food prepared and served – they just know – whew! What I love about Beau Jo’s (besides the food) is the the atmosphere. It feels local to Colorado and that is something you can feel good about supporting if you live here and when you visit the Mile High City too. You’ll feel like you’re eating at a cool, Colorado restaurant, and supporting the local economy. Of Note: My family loves eating here too. They order mountain pies and dive deep into the salad bar. 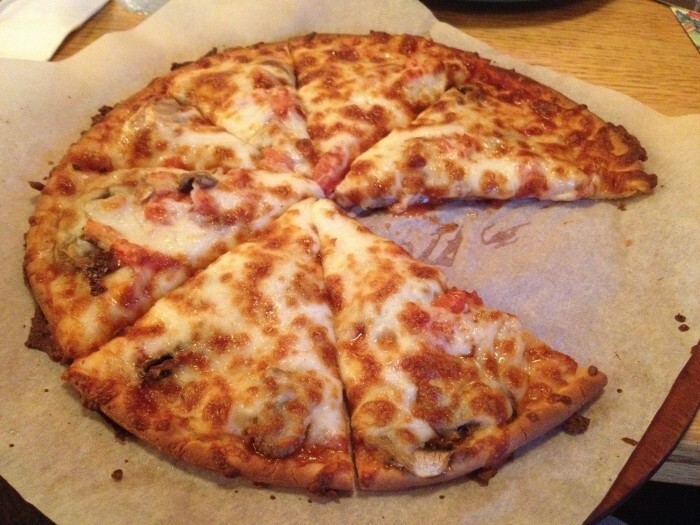 It’s definitely a family fav when it come to getting our pizza fix – two thumbs up!